It took me a little while to warm to the sound quality of this disc. The opening was something of a shock, with a seemingly unflattering rendering of the violin tone of the Violins du Roy in Mozart’s Horn Concerto no.2. However, I quickly got accustomed to it and realised the sound was nothing like as unfavourable as I at first thought. This is a fine ensemble of just fifteen strings plus the necessary wind players. And they play very stylishly despite being not helped, at least initially, by the recorded sound. The two soloists, both closely associated with the orchestra, are fine executants, who give performances which are not only technically assured but warm and full of warmth, lyricism and humour. The horn concertos themselves are a curious bunch; all written for Mozart’s friend, the so-called ‘Ignaz Leutgeb’ (real name Joseph Leitgeb), who ran a cheese shop in Vienna, but had known Mozart in Salzburg. The second, third and fourth concertos were written from 1783 -86 in Vienna; but the so-called first concerto is in fact the last, belonging to 1791. It lacks a slow movement, which suggests, along with the many other missing details, that Mozart was unable to finish it before death intervened. 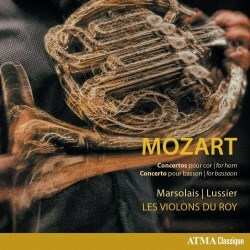 Marsolais plays these works with a beautifully smooth tone, and is brilliant in the occasional bravura passages. His tone is creamy – he is playing on a modern horn of course – and quite open, having none of the ‘bottled up’ quality we sometimes hear from American (US) players. His relaxed, flexible playing in the slow movements greatly enhances the impression they make. Marsolais has provided his own cadenzas, which are not too long and quite acceptable. Mathieu Lussier, who directs the ensemble throughout as well as being the bassoon soloist, is an equally accomplished player. The bassoon concerto was Mozart’s first for a wind instrument, and is a miraculously perfect piece, for which bassoonists have every reason to thank the heavens. Again, the soloist uses his own cadenzas, and plays with an easy virtuosity that is admirable (and enviable!). I could perhaps do with a slightly more expansive lyricism in the Andante – after all, this is a ‘tenor aria’ – but overall the performance is of a very high standard. All of these works – especially the 3rd and 4th horn concertos and the bassoon concertos – are heavily represented on disc. But I can honestly recommend this CD confidently, despite the competition of hornists Dennis Brain (EMI), Barry Tuckwell (Decca), Gerd Seifert (DG) and Alan Civil (Philips), and bassoonists Klaus Thunemann (Philips), Kim Walker (Gallo) and the superb Martin Kuuskmann (ERP) – to name but a few! Unless, of course, you are after performances on the natural horn, in which Anthony Halstead (Decca), for my money, still reigns supreme. Balance between soloists and ensemble is exemplary in all cases.